Front: Allison Volk and David Hartstone. Back: Mallory Wedding, Frank Weidner and David Landberg. 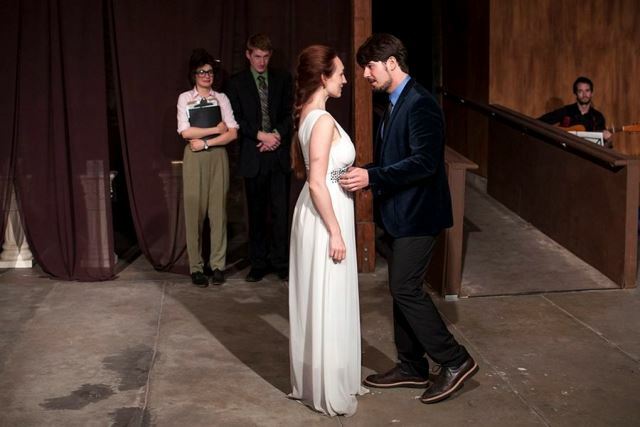 The young, relatively new, City Shakespeare Company is offering a 90-minute modern take on Shakespeare’s The Merchant of Venice now through April 12, but the well-intentioned effort produces mixed results. 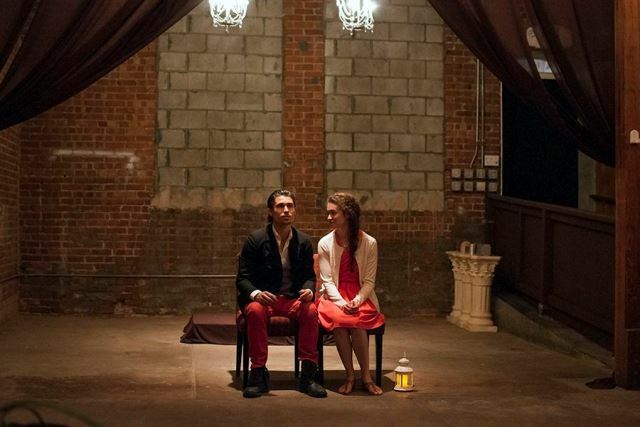 Any abbreviated adaptation of Shakespeare’s text runs the risk of eliminating moments that show the full colors of his characters but director Brooke Bishop not only edits out much of the conflict and harsh reality of the play, she reduces her characters to types, and the villain Shylock to what feels like a secondary role. The play may be called The Merchant of Venice but it is the moneylender that Shakespeare uses to teach his audience a lesson and without his passion and pain, the story’s impact is marginalized. 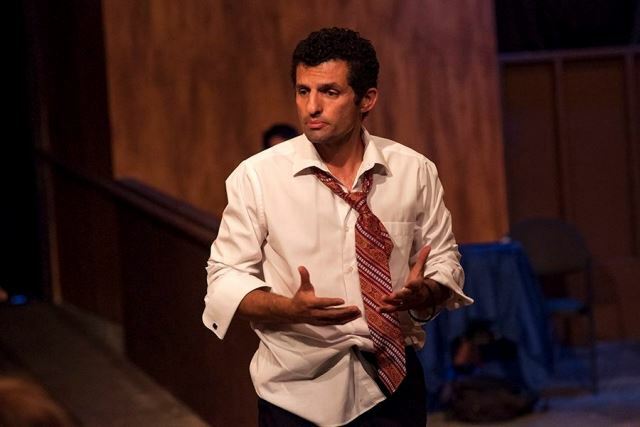 Gone is the cultural insight into Antonio (Todd Elliott) and his friends’ mistreatment of the Jew and many of the references that would explain why Shylock (Peter Nikkos) is so bitter and hard of heart. 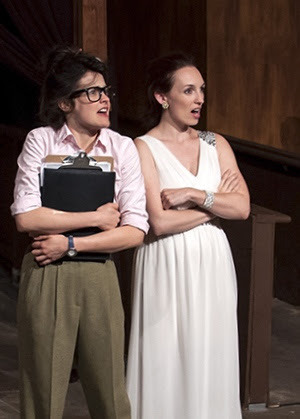 Gone too is the deeper motivation for Shylock’s daughter Jessica (the very sweet Megan Ruble) to run away from her father’s house and marry a Christian, which gives great insight into Shylock’s character. Some of the most eloquent passages have either been dropped to accommodate an actor who is in over his head, or are allowed to remain but are delivered with only the slightest understanding of the text. Bishop also allows the actors to make choices that focus on only one aspect of their character but they do not always work together to create a cohesive whole. Gratiano (Frank Weidner) is a screaming hothead; Portia (Allison Volk), a beautiful, giggling ingénue; Nerissa (Mallory Wedding) looks like a disheveled photographer’s assistant (but she has a great deadpan delivery); and the Clown (Gilbert Martinez) is a comic utility player who covers most of the smaller roles (a Prince, Tubal, Solanio, Balthazar, Launcelot Gobbo, the Judge and others), all resembling some version of a buffoon. David Hartstone, as Bassanio, is the exception and the one to watch for the clearest understanding of his character and most ease with the language. His natural charm, and ability to let the text do its work, won me over. Daniel Landberg has created an acoustic film score of sorts to cover entrances and exits, and while it is pleasant enough, it feels manipulative when it moves into the actual scenes. (Here’s a love scene so I’m going to play my romantic theme music now to make sure you know it’s a love scene.) After a while the recurring themes just became funny. That may have been intentional but it was an odd way to insert humor into the play. When the music serves a purpose, as in the opening exposition scene that introduces the characters, it enhances the play, but when songs within the scenes stop the action and repeat phrases over and over pop ballad-style, it only gets in the way. The majority of the costumes set the time period in present day, but Portia’s Grecian gown and sandals feel like a throwback to an earlier time alongside the men’s contemporary suits and other female modern looks. And oddly, there is no attempt made to disguise her as a man when she plays the doctor in the crucial courtroom scene, yet Nerissa is completely disguised as one in her men’s vest, pants and hat. An interesting Director’s Note in the program says that “The Merchant of Venice is often thought to have been written from a place of hate – we invite you to watch our production from a place of love, and see what you discover.” For me, the discovery is that the play’s larger themes of anti-Semitism, oppression, justice, compassion and the inextricable connection between love and commerce are an integral part of Shakespeare’s story. Diminishing them, whether by editing the text to eliminate unpleasantries or by softening the characters, tells a completely different story; one not written by Shakespeare.